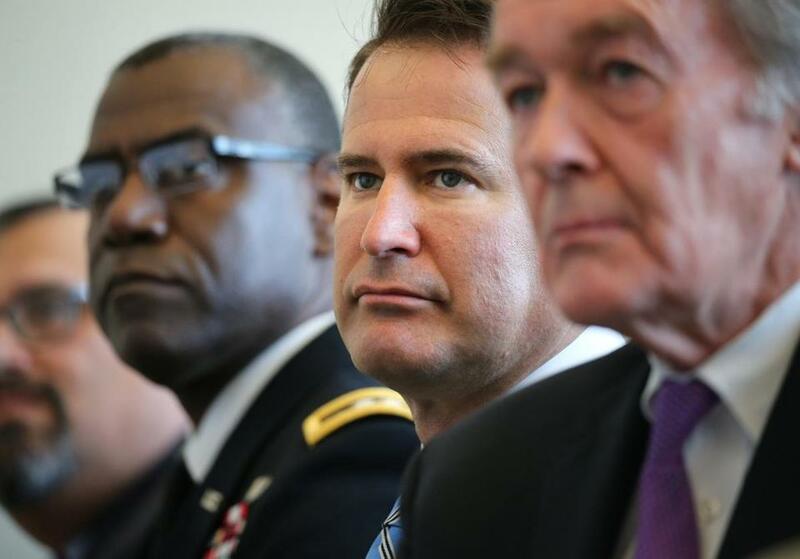 Representative Seth Moulton of Massachusetts, center, during a news conference in Burlington in April. WASHINGTON — Eight years ago, a young Marine Corps veteran approached Mayor Michael Bloomberg while Bloomberg was eating a hamburger with his then-girlfriend at J.G. Melon on Manhattan’s Upper East Side. The Marine interrupted Bloomberg’s meal to tell him that he had strong feelings on the mayor’s controversial support for a group that wanted to build a mosque near the site of the 9/11 attacks. Bloomberg braced himself. “This is going to ruin my hamburger,” he thought. “I really appreciate your stance on the mosque because I think you’re upholding the values that I fought for overseas,” the veteran told Bloomberg, shocking the mayor. Years later, the mogul is now helping that veteran, Representative Seth Moulton of Massachusetts, in Moulton’s political time of need. Bloomberg announced this week he’s spending $80 million this cycle to boost Democratic candidates, which, according to longtime aide Howard Wolfson, will include at least some of the military veterans Moulton has helped assemble to run for House seats. Moulton has contributed $1.9 million to nearly two dozen Democratic candidates with a military background whom he’s endorsed in the 2018 midterm cycle. He’s personally recruited several of them. A vocal critic of House Democratic leader Nancy Pelosi, Moulton has raised his profile within the party by pushing for a “new generation” of leadership and by recruiting and funding centrist, fresh-faced candidates to run in moderate and even red-leaning districts. Moulton is selling his candidates to Bloomberg’s network, arguing for all of them to get a piece of the $80 million. Wolfson said Bloomberg is still weighing which candidates to back but there will be at least some overlap with Moulton’s network. 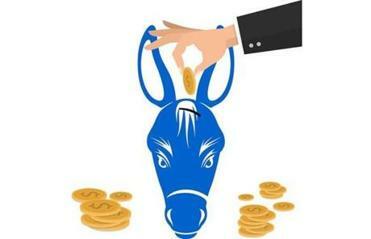 “[Moulton’s] politics are very much in line with Mike’s centrist bipartisanship,” Wolfson said. “It isn’t political idealogy or veterans per se, this is about getting people of good character into Congress,” Moulton said. The former investment banker and founder and CEO of Bloomberg LP is worth $50 billion. He served as mayor of New York for 12 years, until 2014, and has weighed running as an independent candidate for president several times, including in 2016. Bloomberg founded Everytown for Gun Safety, a gun control advocacy group, in 2014, and has used his considerable wealth to back candidates who commit to working to pass gun safety reforms. Bloomberg reconnected with Moulton in 2014, when the former Marine decided to get into politics by taking on a sitting member of Congress from his own party. After Moulton sought him out, the billionaire gave him his endorsement, and the two have stayed in touch since, with Moulton visiting Bloomberg in New York several times. “They’ve had a nice relationship ever since,” Wolfson said. Moulton objects to Bloomberg’s initial description of him as “hulking” — ”I’m the skinniest Marine you’ve ever seen” — but otherwise praises Bloomberg as an astute political player. Moulton has asked Bloomberg for political advice in the past and said he values his judgment. Though Moulton’s recruiting efforts have raised his profile in Washington, some Democrats have privately grumbled that many of those on his list were backed or recruited by the Democratic establishment before Moulton claimed them. If Moulton truly has Bloomberg’s ear, however, his midterm clout will continue to increase. Among the candidates Moulton has backed through his Serve America PAC are Jared Golden, a state legislator and Marine veteran taking on Representative Bruce Poliquin in Maine, and Amy McGrath, another retired Marine, running in Kentucky. The House Democrats’ campaign arm initially recruited McGrath’s primary opponent, Jim Gray, to run against her, but have since put McGrath on their “red to blue” list of hand-picked candidates. Bloomberg’s interest in Moulton’s list of endorsed candidates was first reported in The New York Times, which noted he is also consulting with Democratic leaders including Representative Joseph Crowley, the fourth-ranking Democrat in the House.